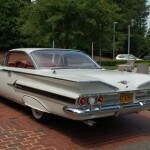 In 1959 and 1960 the Chevrolet Impala was Chevrolet’s top end full-size model. 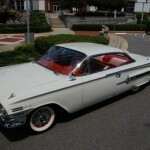 The Impala was made a separate model in 1959 instead of a subseries of the Bel-Air. 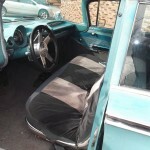 It still used the same platform as the lower end Chevrolet Biscayne and mid-level Bel-Air, but was available with every option offered by Chevrolet. 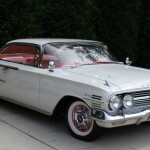 The Impala was offered as a four-door hardtop and four-door sedan, as well as the two-door Sport Coupe and convertible. 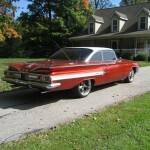 The new Impala shared its platform with Pontiac and lower-end Buicks and Oldsmobiles. 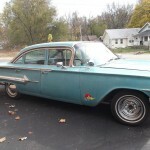 As with the new Bel-Air, the Impala featured a new X-frame chassis. 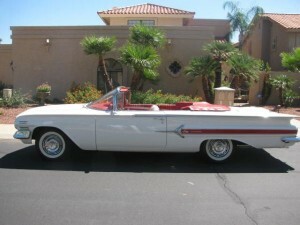 It had a wheelbase 11/2 inches longer, a roof that was three inches lower and the body was two inches wider than the previous model year. New design features included outward protruding tailfins rather than upward pointed tailfins. 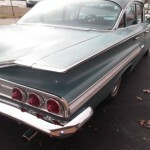 Chevrolet used a single “teardrop” taillight instead of the Impala trademark triple taillight. 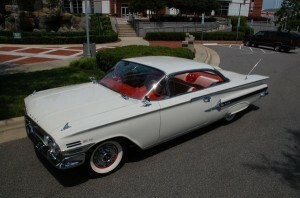 The Impala Sport Coupe featured a shortened roofline and wrap-over back window. 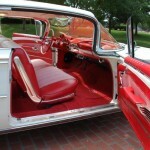 The hardtop Sport Sedan had a huge, pillar-free back window and flying wing roofline. 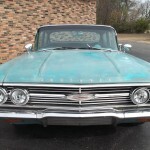 Engine choices in the Impala included a base 283 cubic inch V8 with 185 horsepower, an optional 348 cubic inch 290 horsepower V8 or a a big-block 348 cubic inch 315 horsepower V8. 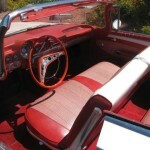 As top-of-the line models, Impala interiors offered front and rear armrests, an electric clock, dual sliding sun visors, and crank-operated front ventipanes windows. A contoured instrument panel held deep-set gauges residing below hoods. 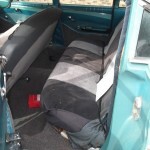 Optional equipment included a Flexomatic six-way power seat and a “Speedminder”. The Speedmider was a device which allowed the driver to set a needle at a specific speed and a buzzer would sound if he exceeded this pre-set speed. 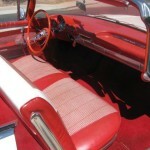 The Impala was slighly restyled in 1960 to create a more conservative look. 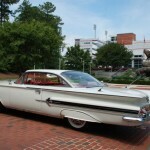 The fin-and-chrome used on the 1959 Impala was already getting dated. 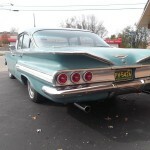 The 1960 exterior changes included replacing the teardrop taillight with three modestly sized round taillights on each side and the front end was revised to remove the intakes above the headlights. 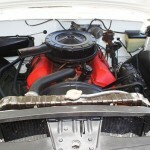 Engine choices were included seven V8s in 283 or 348 cubic inch sizes. 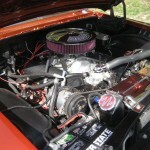 The top choice was the 348 cubic inch 335 horsepower Super Turbo-Thrust Special with triple two-barrel carburetors. 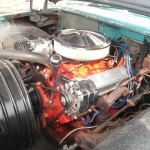 Other options for the 348 engine produced between 250 to 320 horsepoer. 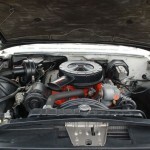 The Turbo-Fire 283 cubic inch V8 could have either 170 or 230 horsepower. 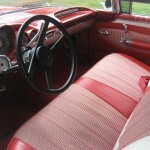 The option list added speed and cruise control, the first time such a device was offered on a low-price automobile. 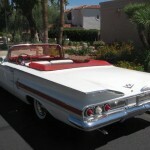 The Impala would be redesigned again in 1961. 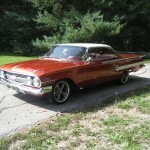 For more information see the Chevrolet Impala 1961-1964 or the Chevrolet Impala 1965-1970. 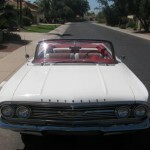 For other classics see our post on the 1965-1970 Buick Wildcat or the 1961-1964 Oldsmobile Eighty Eight. 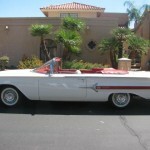 To find your own classic ride or to sell a classic, see the Classic for Sale Listings. 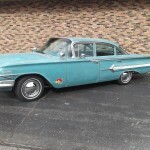 This entry was posted in Chevrolet, Impala and tagged Bel-Air, Biscayne, Brookwood, Nomad, Parkwood. Bookmark the permalink.